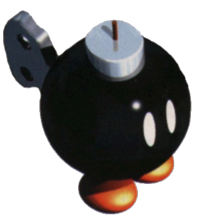 A Mezzo Bomb is a type of Bob-omb that appears in Super Mario RPG: Legend of the Seven Stars. It is larger than a normal Bob-omb, and is summoned by the boss Punchinello while he is low on health during Mario's battle with him. When a Mezzo Bomb attacks, it can deal high damage to a single party member. A smaller version of the Mezzo Bomb known as the Microbomb, also summoned by Punchinello, is used earlier. Mezzo means "middle" or "medium", as it is the average size Bob-omb that is used by Punchinello. This page was last edited on August 8, 2017, at 18:53.